"PAROPAKARENA IDAM SARIRAM" , a tiny quote from the Bhagavad-Gita with an epic meaning about our lives, which was sounded out to Arjuna by Lord Krishna. The faithful meaning of the quote is realizing that our life, our vision, our mission should not only vocalize about ourselves but also should reflect for a thriving society. Anyone can lead life for himself/herself, but only few can lead their lives for the society. In this 21st century high tech world, however, we are still in a stubby level to sustain the basic demands of the poor; it might be shelter, it might be food, it might be clothing, it might be literacy. Food plays a vital role in the Health growth of penuries in society. Sometimes you read a good story so well that you can't wait to share it with the world. There are many people in the world so hungry that they had to exit the globe because of hunger. The little amount we squander will be the ample for a hungry one, but we aren't doing that. The kind made us hungry, made us cry & made us laugh, and that's what so great about food. To accomplish this mission with great vision an organization has been started known as "36Meals.com" inspiring numerous people, and I am glad to be one in the list. Our journey of peace flows from here. Got a reminder about World Peace Day on 21st of September of 2014. On 18th of September, indeed an idea was invoked in me to celebrate the World Peace Day by donating meals. It sounded pretty good but it was a bit stiff to arrange the prerequisites in a short period. Meanwhile, I got worthwhile support by other volunteers. We planned everything on how to carry out the task without having a single meeting. That's the advantage that our current social networks furnished us with. The most crucial thing is fund raising about which we didn't have any estimated tally. So, with potent mind, we moved ahead and formed a troop to initiate the task. Initially, we planned for 100 meals. God blessed the cause within 3 days and we were successful in collecting more than Rs. 4000. 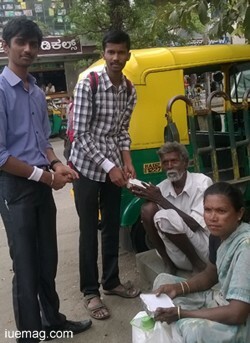 When we asked people to donate funds we spotted the happiness in their faces tagged with a smile. That made us realize - "The ones who take can eat well, but the ones who give can sleep well". A small deed will remain with you which tells that because of you someone got his bread. On attaining the good bit, we commenced to plan about the cuisine; the real game starts from here. We had few confusions but after long time we came out with a good dish and increment in the number to 122 meals. It was early morning on the World Peace Day. All the volunteers met up at Swaad hotel to collect the meals packets, but we didn't have any pointed place for donation. We got to know about Tungabhadra old age orphanage in Saraswathipuram. That was the 1st spot where we saw the bygone people, whose children left them. It was actually pitiable to see. No regrets sometimes, God will solve someone's question through you. We felt happy while donating meals to them; with their blessings we got to know about "Saraswathi children orphanage". With lofty feeling we moved there, happy to see the happy and energetic kids. As we entered they came running towards us. It was great to interact with them. From there we went to "Sree Sharada Nagar". The same experience repeated. It's a normal tendancy of a kid to get know about the stranger in a very delightful atmosphere as the authority was so genial. We moved next to "Akka Mahadevi Orphanage". Within a traditional atmosphere, we were glad to hear our names in their prayers appealing the Almighty to bless our lives with serenity. It was a unique experience for us. We felt overwhelmed when they were praying the Almighty for the achievement of our peace. With a buoyant feeling we went forward to the last orphanage called "Arya sevashram", Rajajinagar, and had fun with the youngsters. It was also an ecstatic moment to take some contemporaries of ours who taught English to them. 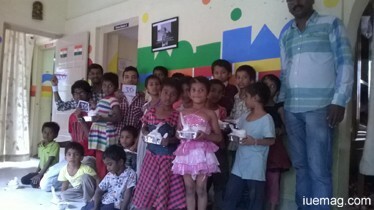 "The happiness is in sharing" - we had heard it long back but we realized it right away amidst those smiling faces. Mainly, the activity also provided the eternal confidence and belief for the needy that there are someone who also cares for them. It was our utmost work for a cause; we are grateful to our mentors for their superior mentoring which made us attain the trust to carry out the "36meals.com event". We believe that one cannot think well, love well, or sleep well, if one hasn't dined well. Any facts, figures or references stated here are made by the author & don't reflect the endorsement of iU at all times unless otherwise drafted by official staff at iU. This article was first published here on 16th October 2014.